30th Dec 2017 : v1.0.2 released with safety disabled. Safety was showing blank screen when fullscreen. Controller support for nontouch screen still pending. 30th Dec 2017 : v1.1.0 Controller support for non touch devices done. Includes fullscreen and back nav support as well. 1st Jan 2018 : v1.1.2 Stability fixes and support to resume video if was playing before app was minimized. 2nd Jan 2018 : v1.1.3 Ability to open any website via “Google search” option. Also send any custom url from the phone app. The car app remembers the last url visited and loads it automatically. 2nd Jan 2018 : v1.2.0 Speech to text for youtube searches. Minor fix to controller inputs. 2nd Jan 2018 : v1.2.1 Possible first fix for audio volume not controllable. 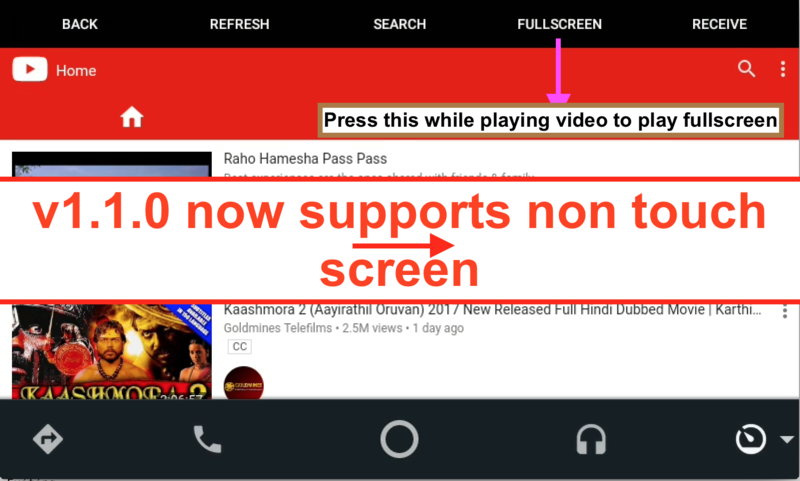 3rd Jan 2018 : v1.2.2 Full screen videos can be toggled more easily due to floating toolbar. Speech recognising view not hiding bug fixed. Its clickable just in case it doesnt hide. Progressbar to show page load progress. 5th Jan 2018 : v1.2.4 Fixed black screen which appears sometimes. Possible third fix for volume control in some systems. 6th Jan 2018 : v1.3.0Night mode support for Youtube added. Switch on your headlights to see the magic. 9th Jan 2018 : v1.3.1 Full screen mode now persists across videos. No need to switch fullscreen mode for each video on a playlist. It also stays on across app launches. You also should see a slight page speed boost. 12th Jan 2018: v1.4.1 If you have crashed when accessing youtube purchased videos, this build will fix it. 13th Jan 2018: v1.4.2 Please uninstall all previous builds and install this one if “youtube auto” has suddenly disappeared from Android auto (from last 1-2 days). If you dont uninstall previous builds, there is a chance that 2 similar looking apps show up. This is possible because Google has blocked my previous app. Still not 100% sure. 13th Jan 2018: v1.4.3 About link redirecting to 404 page fixed. 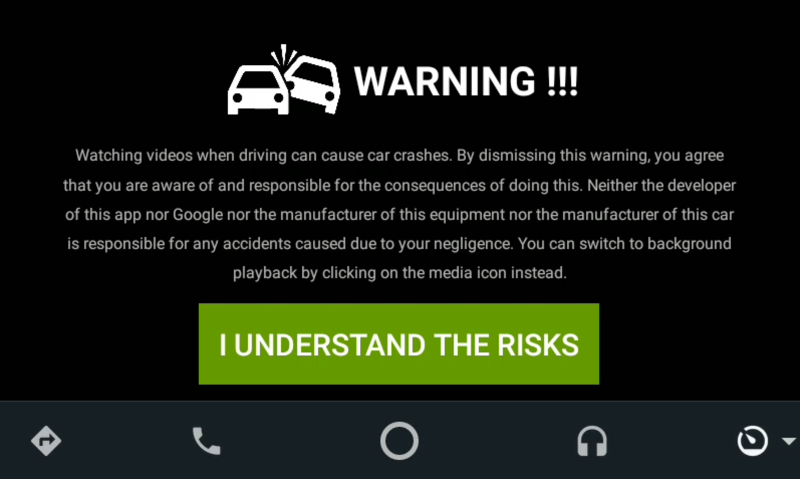 14th Jan 2018: v1.4.4 Safety Warning popup added which pops up everytime you start driving. This warning will disappear if you use handbrake/parking mode. 15th Jan 2018: v1.5.0Aspect ratio support to remove black bars. You can toggle between aspect ratios in full screen mode. Also irritating notifications have been removed. 15th Jan 2018: v1.5.1Fullscreen controls support for controllers, use right,left,up and center to seek, change aspect ratio and play/pause. 15th Jan 2018: v1.5.2Bug fixes for “I understand the risk” not clickable for some users. Fixed steering mounted controls not working the first time. 18th Jan 2018: v1.6.0Youtube auto renamed to CarStream with new logo. Looks like google bannned again. So if previous app is not showing up, use this app. 19th Jan 2018: v1.6.1Youtube auto renamed to CarStream with new logo. Looks like google bannned again. So if previous app is not showing up, use this app. 25th Jan 2018: v1.7.1 Italian and chinese translations added. Check the credits section for how to add more languages. Thanks to everyone (mentioend in credits) for translating. 26th Jan 2018: v1.7.2 External SD card support works with most devices. Look for the ‘external storage’ bookmark. French translation added. issues related to local videos not playing correctly fixed. 8th Feb 2018: v1.8.3 Bug fix release for audio focus issues. If carstream overwrites other players, this version fixes it. Also local audio/video continues to play in background. 21st Jun 2018 : 2.0.0 Introduces a way to unlock carstream in rooted phones. Thanks to ‘slashmax’ for figuring out the trick. The following message is shown if handbrake is not applied. Please make sure you use this app safely. CarStream is developed and maintained by me in my free time. In order to efficiently manage my time, it would be great if you can use github for raising bugs and feature requests. I have been using this blog’s comments section till now for this, but it doesnt scale well. So if you put anything here, it will mostly get ignored. So please use github. I know its painful to create a github account, but it helps me. Before raising a github issue, check if the same issue exists, otherwise it will most likely be closed. Black screen when switching on Youtube auto is usually related to Power saver mode on your phone. Some phones have it as “aggressive doze mode” or “advanced battery optimization”. For youtube auto to work seamlessly, you have to switch off power saver mode completely or disable it just for Youtube auto. Many users have requested this feature of hiding the nav bar when in fullscreen mode. Unfortunately google doesnt support this feature and we can expect google to give an API in future version of android auto. So this is not feasible. If you want to add new features or checkout the code visit https://github.com/thekirankumar/youtube-android-auto/ Pull requests for new feature are welcome. If you like this app, please make a donation. Unofficial Android SDK https://github.com/martoreto/aauto-sdk Without this SDK this project wouldn’t exist. Thanks to Martoreto for reverse engineering the Waze app and coming up with a easy to use SDK and a sample app. VideoEnabledWebview https://github.com/cprcrack/VideoEnabledWebView This webview makes fullscreen videos easy to implement. Disclaimer :This is my personal project and I maintain it in my free time. The work here is in no way related to my Employer. It is a hobby project where I have not committed to anyone about maintaining it. With Google blocking every move, its getting more difficult to progress. You can imagine how it would be to fight as a one man army against google. [21st Jan 2018] Google has blocked the app multiple times till now and its becoming difficult for me to release just a new version to unblock it. Here are some tricks to do it yourself when google blocks the app. Google blocks the app’s package name. This is how apps identify themselves and google is able to block the app easily by just identifying my app’s package name and then blocking it. As a workaround, if you are an android developer, just clone the source code and change the package name in build.gradle as well on the google-services.json file. If you are not a developer, I recommend you use APK Editor Pro app (Its a paid app, but the apks are available everywhere). It allows you to change package names of any app without creating the APK yourself. click on the second line from top called “manifest xmlns:android…. Click save button, be careful not to press cancel. If you get install issues with APK editor, try APK cloner. It doesn’t let you change package name, but it automatically chooses a package name and is easy to use and free. If google blocks the apk again, come back here to this section for a new workaround. Print article This entry was posted by Kiran Kumar on December 29, 2017 at 12:36 pm, and is filed under Uncategorized. Follow any responses to this post through RSS 2.0. You can leave a response or trackback from your own site. How do you guys stop the white top bar that comes down when a new page is loading? It says something like “[email protected]…….” and takes up a large portion of the top screen.